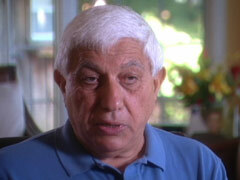 BOB FAW, correspondent: Even today, nine years later, what happened at the Twin Towers horrifies, wounds, inflames. SALLY REGENHARD: Our loved ones’ blood really consecrated that site forever and ever. 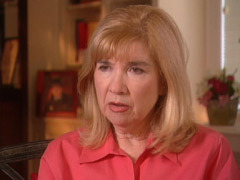 FAW: Sally Regenhard’s only son, 28-year-old firefighter Christian, a Marine, aspiring writer, and avid rock-climber, was killed on 9/11. No trace of him has ever been found. REGENHARD: My son was a saint who was murdered by sinners. FAW: Among the more than 2700 killed in Lower Manhattan that day was firefighter Bill Burke, who got his men safely out of the doomed towers before he perished. MICHAEL BURKE: He got Engine 24 and the civilians they saved out. A fireman who worked for him said Bill Burke led the best of the best. He was better than all of us. FAW: Nothing is more hallowed than Ground Zero for relatives like Regenhard and Burke. BURKE: There’s just a sense of sanctity to the site that’s being offended here. FAW: Ironically, Muslims proposing that 13-story cultural center on Park Place two blocks from Ground Zero insist they are trying to honor the site. Daisy Khan is director of the American Society of Muslim Advancement and wife of Imam Feisal Abdul Rauf, organizers of the project. DAISY KHAN: We’ve been in the neighborhood for 27 years. It’s our neighborhood that got attacked, and it’s our obligation and our responsibility and really even our honor to rebuild it. FAW: Daisy Khan insists that the center, which will include an arts theater, a place for prayer, athletics, and education, will be a testimonial to healing and interfaith harmony. KHAN: The extremists have defined the agenda for the global Muslim community, and we wanted to amplify the voices of the ordinary Muslims who are, you know, law-abiding citizens, and it was my way of, like, helping rebuild by building a center that would create a counter-momentum against extremism. REGENHARD: I want to make it clear that I and my—members of my group do not have anger towards Muslims. But it’s too close, it’s too painful, it’s too soon. I’m still trying to find remains of my son. BURKE: It amounts to an insult. It comes across as intentionally provocative. KHAN: I think it would be un-American to ask anybody to leave the neighborhood. We’re part of the neighborhood. I don’t think anybody should be driven out of their neighborhood. It’s about acceptance. Muslims are not being accepted as equals in this country yet. MOSQUE PROTESTER: No mosque, not here, not now, not ever. FAW: Indeed, throughout the country there are recent signs of what some call Islamophobia. Nearby, on Staten Island, an abandoned Catholic convent was to be sold to Muslims to build a mosque. But after much protest the board of the church that owned the convent voted the sale down. In Columbia, Tennessee a mosque was fire bombed. In Murfreesboro, Tennessee, vandals targeted equipment being used to build an Islamic center. 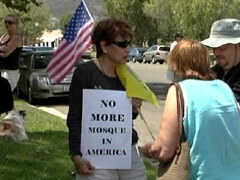 And in Temecula, California the site of a proposed mosque brought forth both sides of the debate. MANGO BAKH: Islam is not a religion. Islam is a totalitarian, terrorist ideology. JENNIFER EIS: There is nothing to fear from them. They are our neighbors, and they want to be able to worship freely, just as our ancestors did. FAW: Against that backdrop is it any wonder that a prominent anthropologist who’s recently completed a landmark study of Muslims in America concludes the Muslim community feels “under siege”? AKBAR AHMED (American University): Americans are really going through a time of uncertainty, of some fear and some anger, and they want to blame someone, and in times like this that’s why you’re sitting on a tinderbox. It’s very easy to then suddenly target or make a community a scapegoat, so even something as simple and ordinary as constructing a house of worship becomes an act of defiance, controversy, debate. FAW: The debate over that proposed Muslim cultural center here, so close to Ground Zero, has been framed as a choice between religious tolerance and honoring the dead. But some would argue the real question is not the Constitution but sensitivity—that given what happened on 9/11, shouldn’t moral claims take precedence over legal rights? THANE ROSENBAUM (Fordham University Law School): The legal issue’s clear. 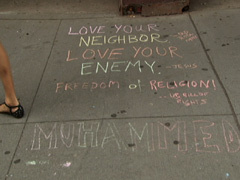 There is a right to free speech, and there’s a right to the exercise of one’s religion. We have that. Now what? What happens in situations where the exercise of that free religion, right, is going to trample upon the profound sensitivities of an already vulnerable, traumatized group? FAW: Thane Rosenbaum, a professor at the Fordham University Law School, says the relevant precedent is 1984 when, 40 years after World War II, Holocaust survivors objected to a Carmelite convent proposed near Auschwitz and Pope John Paul intervened and moved the building elsewhere. That kind of compassion, says Rosenbaum, should prevail at Ground Zero. ROSENBAUM: This isn’t about bigotry. This isn’t about religious persecution. This really is about sensitivity and a profound sense of loss. There’s something that just doesn’t feel right about the haste, the speed, the urgency with which their mosque must be there. I don’t see the tolerance in that. It seems to me the tolerance there is only one-way tolerance: religious liberty and freedom at all costs. FAW: In the midst of all the turmoil, some relatives of 9/11 victims—it is difficult to say just how many—do support the cultural center near Ground Zero. On that terrible day nine years ago, Herb Ouida was working on the 77th floor of one of the towers, while his 25-year-old son, Todd, was on the 105th. HERB OUIDA: I said, “Have a great day, sweetheart.” I tell you those words because those were my last words to my son. FAW: A son, he remembers, who overcame a long battle with anxiety to go on and graduate from the University of Michigan and have a bright future in finance. OUIDA: I think religious tolerance honors those that were lost. What we’re saying for the Muslim world is we don’t trust you, we don’t like you. FAW: We don’t want you. 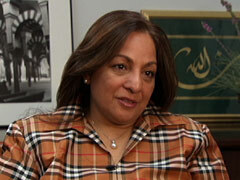 FAW: Daisy Khan says most 9/11 families agree with Herb Ouida and support the Islamic center. But for relatives like Sally Regenhard, the refusal of those backing the Islamic project to consider another site is just one more indignity. REGENHARD: You can never change hearts and minds by shoving your culture or religion down the throats of others. I think they need to understand that. FAW: With both sides so entrenched, the outcome is uncertain. What is clear, though, is that this dispute is about far more than location or real estate. OUIDA: I’m just afraid that we—that there’s something we’re unleashing here, something that we won’t be able to control if we don’t stop it. AHMED: I think there’s a bigger crisis taking place right now, and that is really the battle for American identity itself. What is the America that’s going to come out of this? KHAN: Are we going to erode our ideals, or are we going to continue to live up to our ideals and let this moment be a passing moment, and let this be the test, the litmus test? FAW: It is much more than a litmus test, though, for some whose wounds may never heal. REGENHARD: Right now we’re asking for sensitivity, and maybe my son could have accepted what’s happening now, but we mere mortals—we cannot. FAW: In the midst of enduring pain, shrill protests, and calls for compromise, then, a head-on collision between legal and moral rights in a debate which could determine in post-9/11 America whether tolerance is a two-way street. For Religion and Ethics NewsWeekly this Bob Faw in New York.